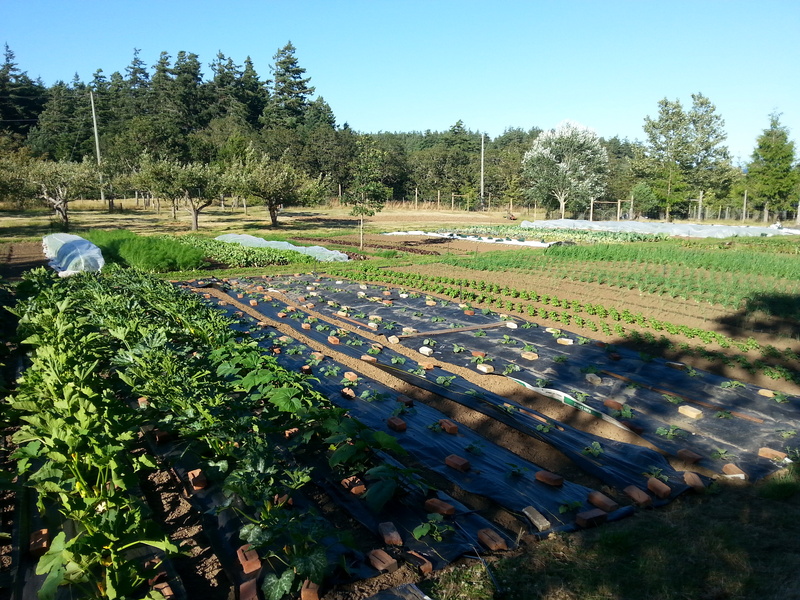 So your local food box farmers are trying something new this year. On August 23rd, we would like to invite our box members to a farm day. 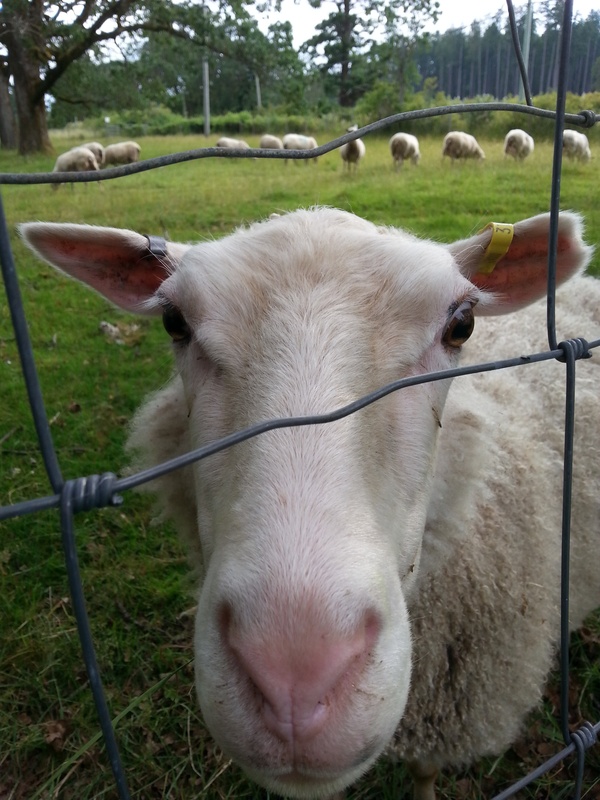 This will be a chance to visit Wind Whipped Farm, stop by the Stillmeadow Farm and Parry Bay Sheep Farm farm store, hang out in beautiful Metchosin with your farmers and fellow box members, say hello to local ewes (like the one below) and more. We’re planning on keeping it simple but fun, so please save the date and stay tuned for details. We’re just about to start our sixth week of the box program. We hope box members have been satisfied with the content, quality and quantity of veggies, meats and eggs. On the producer side, we are happy to report it has been smooth sailing so far. Of course, there are always a few challenges along the way. 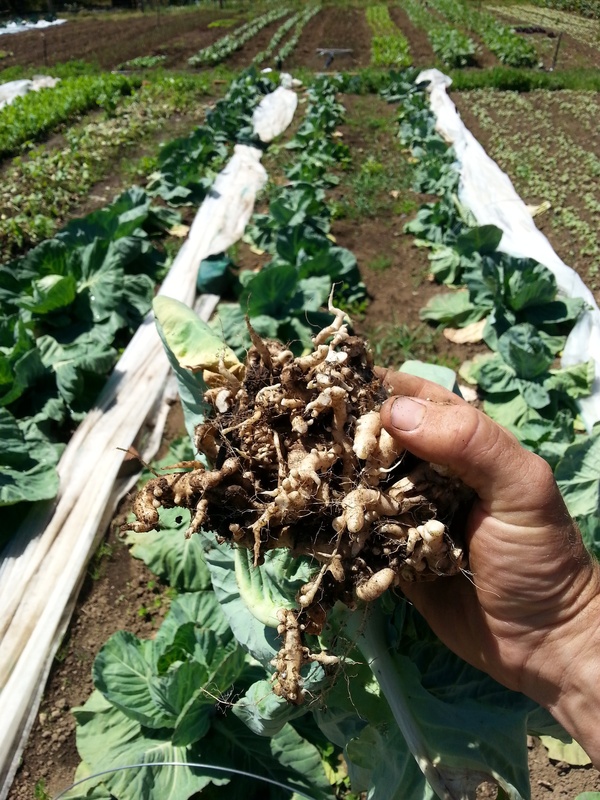 At Wind Whipped Farm, our efforts to grow cabbage did not overpower the clubroot. Clubroot is a common disease that affects brassicas/crucifer (the cabbage family) by forming abnormal root scabs or galls, as is apparent in the following photo of the root of our infected cabbage. Unfortunately we had to till in our sick plants, so sauerkraut enthusiast will have to shop elsewhere to fill up their crock for this season… but yes, we love cabbage and we do have a plan to address this issue in 2015! You might be wondering, are the crazy carrots from week 5 a result of clubroot? Nope, carrots are part of the umbel family, and their particular shape was due to an early transplanting experiment. 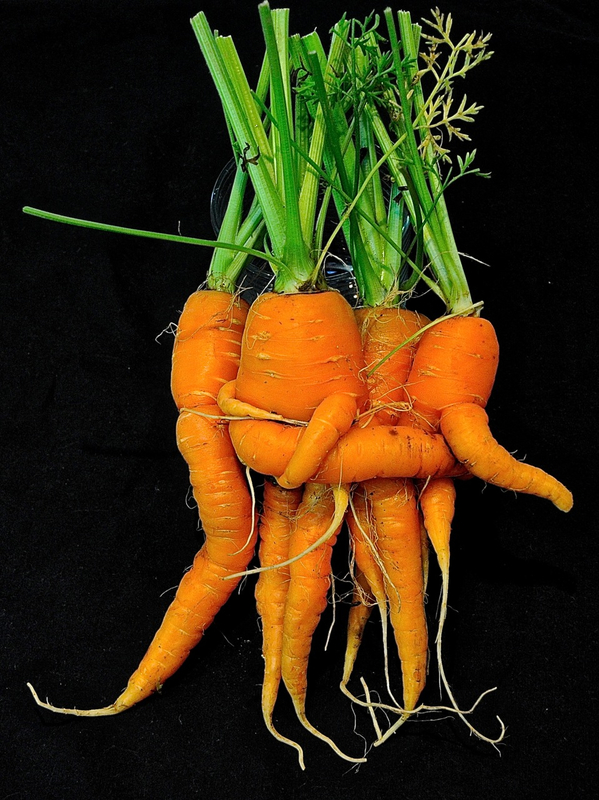 Below is a lovely picture of these crazy carrots taken by box member Barry Herring. Beets are also not affected by clubroot and box members can expect more bunches in their box this week. Split wheat and beet root salad anyone? 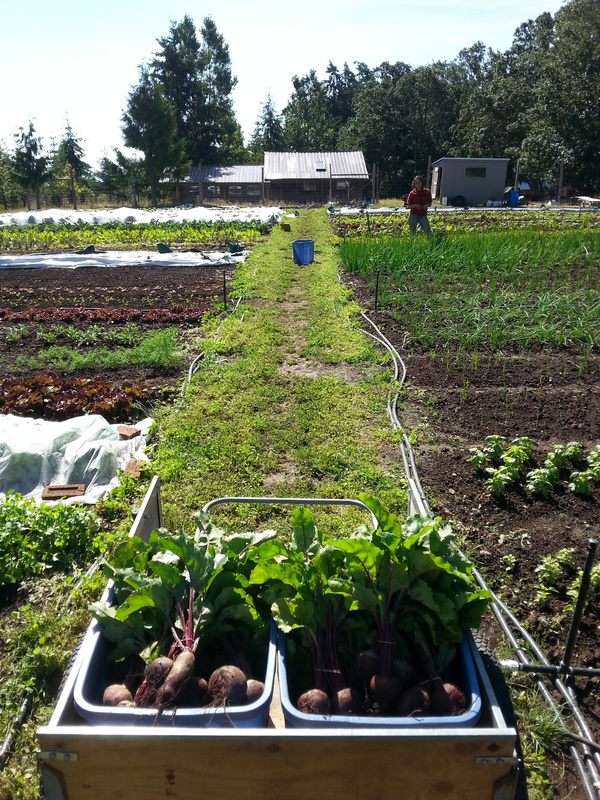 The recent hot weather is helping beets size up but the hens at Winter Creek Farm and SRS Farm are slowing down. 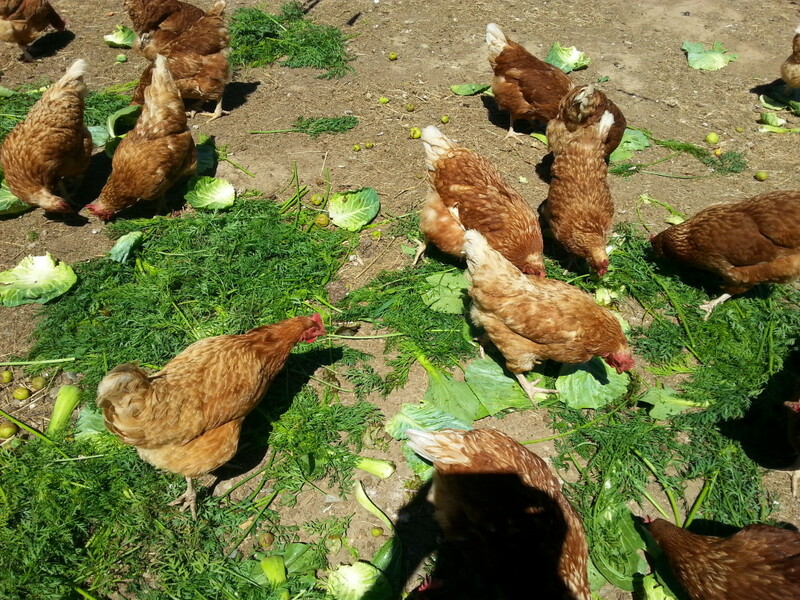 Still, their appetite for garden clippings is undeterred and they continue to lay plenty of delicious eggs. Wind Whipped Farm recently acquired a used rotary plow from our friends at Steel Pony Farm in Red Deer, Alberta. 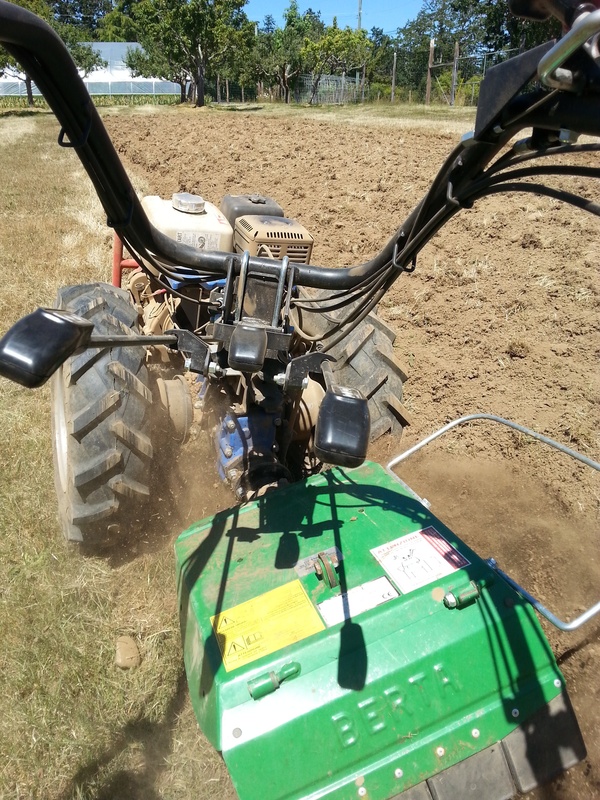 We’ve been breaking ground in a previous pastured area to expand our vegetable growing space in 2015. Go Berta! Finally, below is a picture of the Wind Whipped Farm field. At the forefront of this image are summer squash plants: we expect the yield in future weeks to be plentiful, so now is the time to dig out those zucchini recipes (one of our favorites is by far Yotam Ottolenghi’s Zucchini and Halzelnut Salad). Bon appétit!